HELL’S KITCHEN — R.L. Stine may call the Upper West Side his home, but the "Goosebumps” author won’t set any of his spooky books in New York anytime soon. At a celebration of the 20th anniversary of his signature children’s horror series at the Intrepid Sea, Air, and Space Museum, Stine said Thursday that he’s long feared plotting a novel in the city he calls home. “It’s now a superstition of mine — if I write one, it won’t go well,” he said. 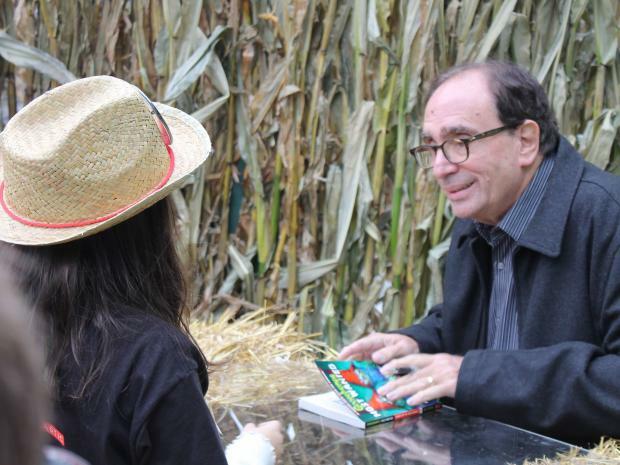 The 69-year-old author said he initially picked the suburbs and rural America as his settings for "Goosebumps" because that’s where most of his audience lived. That doesn’t mean New Yorkers can’t identify with Stine’s massively popular book series. On Thursday, dozens of excited third-grade "Goosebumps" superfans from the Upper West Side’s Mandell School came to the Intrepid for a reading from the author's new series, "Goosebumps Most Wanted." The kids also hunted through a haunted corn maze set up at the museum for a Halloween-themed celebration of their treasured books. “We are definitely a Goosebumped school, aren’t we Mandell?” said school librarian Kathy Armbruster, eliciting screams of "yeah!" from the kids. To celebrate the anniversary of the series, publisher Scholastic donated 500 books to Mandell's library, along with a complete "Goosebumps" collection for the third-grade class. Stine said many of his original readers have begun to have kids themselves, and that the appeal of his books is multi-generational. “Goosebumps Most Wanted” revisits characters from the classic series, including "Slappy," the possessed ventriloquist dummy that terrified a generation of readers. Stine has also set his sights on faithful readers with his newest work, an adult horror novel called “Red Rain,” a creepy story of murder, lies and adopted twins who may or may not have a sinister background. The book is set in Long Island, Stine noted. “That’s as close to New York as I’m going to get,” he said.